IMS, an ever-expanding gastroenterology practice, realized its current paper-based PM system was too expensive and lacked the necessary advanced functionality, resulting in a continued use of paper. IMS looked to switch and implement a comprehensive EHR solution that was affordable and would replace the need for transcription. eClinicalWorks’ comprehensive EHR solution, with unified practice management, met the needs of IMS. It provides the functionality needed to eliminate transcription and streamline front-office and back-office workflows. 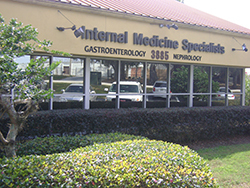 Internal Medicine Specialists (IMS), an 11-provider practice located in eight locations throughout Central Florida, provides services in gastroenterology. Its goal is to provide care the way it once was, not as a number, but as a patient, a person, who needs help, information, and the best options laid before them. eClinicalWorks develops and implements healthcare IT, including EMR/PM software, patient portals and community health records for customers of all sizes and specialties. For more information about eClinicalWorks, please visit our About Us page.